Gold Label Cod Liver Oil for Horses is a concentrated formulation containing a careful blend of cod liver oil, marine oil and pure vegetable oil. The product offers a stabilised source of vitamins needed for general health and condition. Ideal for show stock, young and pregnant animals, or any in need of a little nutritional support. Including cod liver oil into your horse's feed may help increase the palatability of food. Below are some recent questions we've received regarding Gold Label Cod Liver Oil for Horses, including answers from our team. Suitable for ponies prone to laminitis? My 24 year old pony is starting to get a little creaky in her joints. 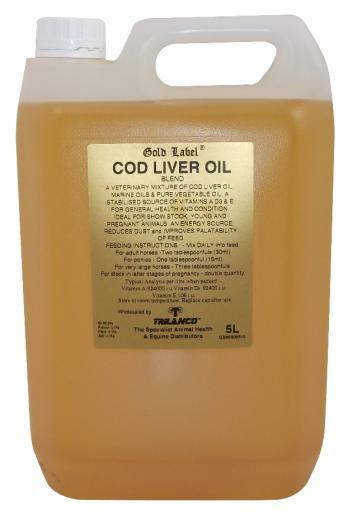 I want to start using cod lover oil as it does wonders for my joints, is this suitable for a 24 year old good doer, who has cushings and is prone to laminitis? It would be best to run this by your own vet but in my opinion it is fine to give the cod liver oil as long as you are careful not to let her gain weight which will obviously make her more susceptible to laminitis. However you may prefer to use a more concentrated joint supplement such as Yumove which should be more helpful to her joints whilst adding fewer calories to her diet overall.